How Much Did the Kitchen Cost? 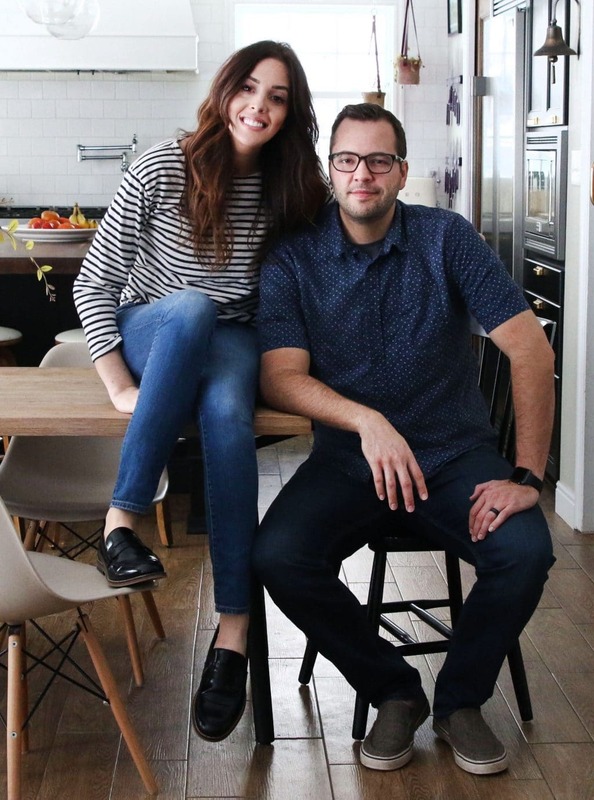 It came as a big surprise to us that the number one search on our site is “kitchen cost.” We never planned on breaking down the total kitchen cost in its own post, since we did share costs of projects and purchases as we went and also a complete source list. But also, there are a lot of factors that come into play that won’t be the same depending on what part of the country or world you live in like gas lines or construction costs. But after enough inquiries, and our budget post last week, we decided to lay it all out on the table. 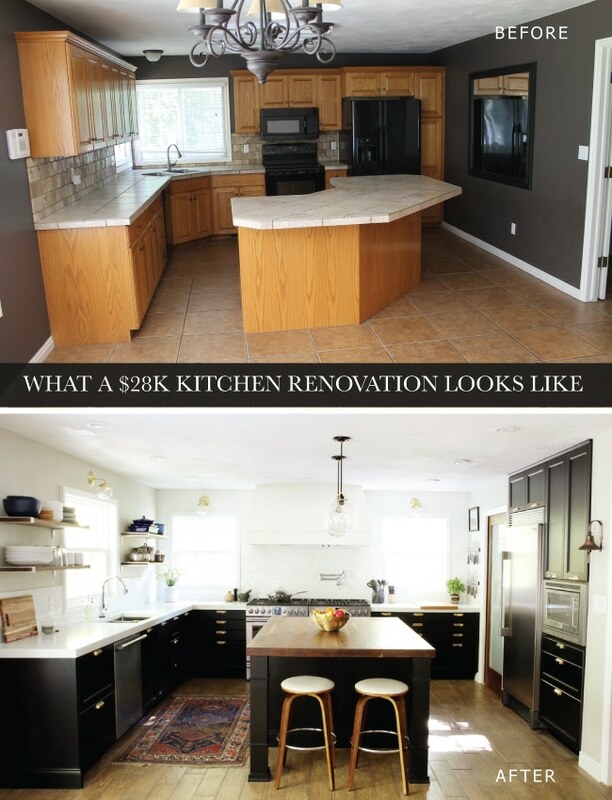 So how much did our kitchen renovation actually cost? In short, about $28,000. For reference, the kitchen is about 13×11. That is not including the walk-in pantry we added or the recessed portion where our new fridge, microwave and cabinets surrounding those are (add another 2′ for that). All in all, it was a good mix of splurge and save items. Considering the average cost of a kitchen overhaul is $54K (the cost of a minor kitchen renovation comes in at just over $18K), we’re feeling pretty good about where we landed on this kitchen we took all the way down to the studs and rebuilt. We could have easily spent way more money, but we could have pinched pennies more, too. But that’s just us in a nutshell. We like to be somewhere right in the middle, mixing splurge and save pieces. For instance, while the white concrete countertops were a save, the black walnut island top was a bit of a splurge. We saved by going with Ikea cabinets (in their Laxarby finish) but splurged a bit on hardware, which I always think is a good idea. While the appliances were provided by Frigidaire Professional, we chose them because they look really expensive and high-end, but cost about half of what another all-refrigerator or 60 inches of range would cost (we pushed 2 30″ ranges together to achieve the look here). A major save. How does it break down dollar for dollar? So there you have it! That’s what a $28,000 kitchen renovation looks like. While I did include the cost of items that were c/o, like the appliances, I didn’t include decor or plates or anything in the cost break-down, because we mostly had all of that. But if you’re curious where anything came from that’s not mentioned in the list above, you can check out our Shop Our House page for image links to just about everything in our house. I can barely believe it’s already been 6 months (tomorrow!) since we finished this space and shared it right here. The honeymoon period is still going strong. Hope this helps a bit in your upcoming kitchen remodels or plans! « Chris’s Cookbooks are Back! How do you feel the quality is of your ikea cabinetry? Are they solid wood cabinets or are they particle? I love your cabinets but convincing my husband that ikea is the way to go may be difficult! Ikea has a crazy amazing warranty and we are so ecstatic about the quality. They aren’t solid wood though. Hi! Like everyone else, I love all that you do and provide online for the rest of us. Thank you! I have a silly question. Why 2 stoves??? GENIUS IN MY OPINION!!! But what made you even think 2 stoves??? It actually looks great. I love it and want to do it in my kitchen, but how did it even occur to you to even take this route? Love it all!!!! Great job. I think I saw a picture of it somewhere, and when looking at the price difference it just made so much sense. 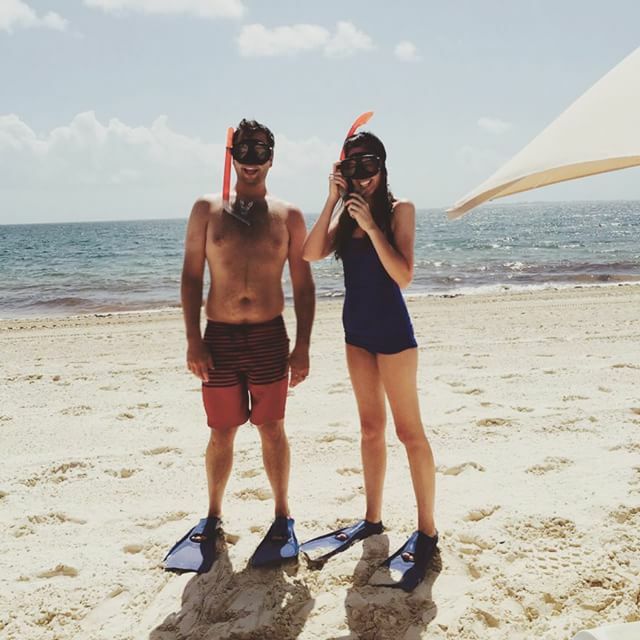 HELLO Chris and Julia, I love your blog and it has been a huge source of ideas and motivation. We bought our first house and it’s a 1905 one with big need of remodeling. We would like to remodel the bathroom (there is just one) this spring and kitchen once we save enough for it but I wanted to ask how can we enter in the spring remodels you do from Lowe’s. We would love to give it a try as there is a lot that needs to go! Do you by chance know the length from the wall where the couch is all the way to the wall where your stoves are? I believe it is about 35′. We’re looking to get the All Fridge and Freeze combo like yours and just wondering if you’ve bought the trim kit separately for each appliance to achieve the “built-in” look. Thanks for your help! P.S. Oh! Does the fridge come with a water dispenser? What do you use for drinking water? The trim kits are purchased separately and the fridge does not have a water dispenser but the freezer makes ice. No, these are standard Ikea cabinets in Ikea’s Laxarby finish. All costs are included here. I love your kitchen. You guys are such an inspiration! We are remodeling our house right now and going with ikea laxarby cabinet. I’d life to do a range hood like yours. What sheen and color did you paint the range hood? Hi Julia – Can you share the source for your recessed lighting? I tried to look for that info in your kitchen posts and “Shop Our House” page, but couldn’t find it anywhere. We’re getting ready to hire someone to come and add recessed lighting but they want us to provide all the materials. Any tips on shopping for recessed lighting would be greatly appreciated! Can you tell me the source of your kitchen step stool?? What a beautiful remodel!! Yes, the island cabinets were included in our cabinets cost. I would say the cabinets were relatively easy to install. The only ones that gave us grief were the ones in our recessed portion around the fridge, but only because it was a very, very tight space. Haha, all of our small appliances are in the large bottom drawer to the right of the range. We don’t drink coffee, but we do use our blender and toaster almost daily and just tuck it in. You can tour all of our drawers right here if you want. So glad you posted this! We’re going through a kitchen renovation as well. It is much smaller, but it’s always great to read transparent and honest posts like this! Absolutely love this kitchen!! Did you do any of the work yourselves? Was all of this work done yourselves or hired out? Might be a silly question but I’m new to your blog! Regardless, beautiful job!! We did almost all the work ourselves. You can read about what we DID hire out here. Thank you for the cost breakdown! We are saving our pennies right now to re do our 50 year old kitchen, and I am glad our budgeting seems to be right on track. 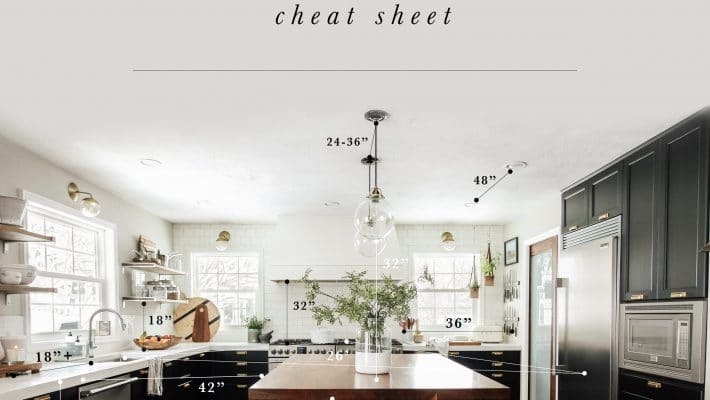 Quick/ random question- Do you have 8ft ceilings in your kitchen or are they 9ft? 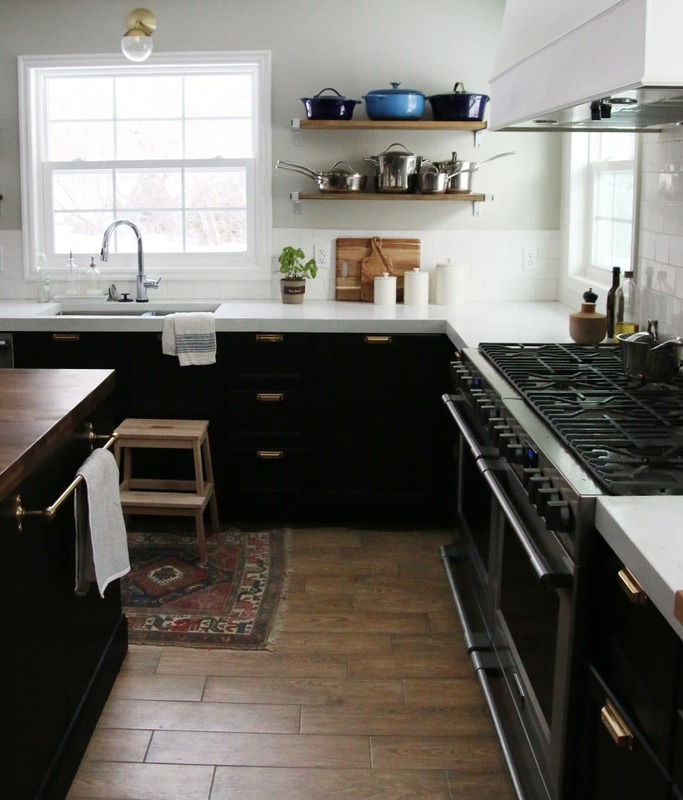 This is seriously my favorite kitchen renovation I’ve ever seen! So beautiful and so functional, and on a realistic budget. I love the color combo too. I really appreciate you sharing the cost. It’s helpful as we go into renovating out kitchen. Question…how much clearance is between the island and the countertops/fridge area? I have heard 36″ absolute minimum. We have a 13 x 14 kitchen and would love a big wide island for lots of prep space. When I do the math, I end up with only room for a less than 3″ island after I subtract out 25″ for the cabinets and then 36″ for the fridge on the other side. Would love to hear your thoughts! There’s 45″ from the island to the fridge, 44″ from the island to the ranges and about 41″ from the island to the sink side. Couple things to consider: A counter depth fridge will shave a good 10″ off your fridge depth freeing up loads of space. We also opted to put our seating on the dining room side by design. It keeps the work space walkways free to, well, work in and not have to worry about seating interference. Thank you for this post! I still drool over each picture you post of your new kitchen. We are a few years away from a full gut job on our current kitchen so I’m vicariously living through you. I know it’s all relative to an individual’s market and area but providing this breakdown and transparency means so much to me as a reader. You guys work hard and it shows. I just want to move right in! Thanks for sharing! It is really helpful to see cost break downs. I just want to copy every single thing you do!!!! Lol. Can I just come chill at your beautiful home for a week?? Or a year?? Love it all!! Great job. Just wanted to echo similar comments and thank you for sharing the cost rolled into a large overall number. It’s so hard to know how much seems reasonable and how far money goes. Granted, everyone has a different approach and priorities, but it really helps to begin to ball park. I appreciate your willingness to share!!! Thank you for sharing! It’s very helpful to know a ballpark, a starting point. We’re considering buying a house right now that’s a total gut job, so we’re trying to determine how much it’ll cost to renovate, so having a real-life (and AMAZING!) example is fantastic and so helpful. Thanks! Wow- LOVE THIS! The transformation is unbelievable and I can’t believe you did all of this for 28K! One question, where is the freezer? It looks like you just have the refrigerator in the kitchen unless it’s a combo unit? Beautiful job- thanks for posting prices! It’s in the pantry! Heavenly. I added the price to this kitchen breakdown, but didn’t add the pantry cost. Oops! You can see it in this post though. Beautiful kitchen, thank you for the break down of costs. So you did ALL of the work yourselves? Installed windows, built out island, all electrical and plumbing? It was a mostly DIY kitchen, but we did hire some things out. You can read about those things (which I included in the budget breakdown) here. I think it was totally worth it! I love the colors and I still love the idea of the two smaller ranges put together! Hello Julia, I’ve been following your posts for a while – thanks for all the awesome info! Can I ask how do the black cabinets hold up with little kids – we have a 2 and 5 year old. Do finger prints etc show very well on them? I’m trying to convince my husband they will look good in our house….! You know, I haven’t wiped them down more than once in 6 months! So I would say they are doing really great! Haha. They have more of an eggshell finish rather than a semi-gloss or glossy finish like a lot of cabinets which helps. Thanks for breaking it all down! This is one of my all-time favorite kitchens. We’re buying our first (very dated and un-exciting) house right now and I’m dreaming up kitchen plans already. This is super helpful! Thanks for sharing! We’re in the process of looking for a new house and it’s likely we’ll need to do some kitchen updates. Gorgeous kitchen, I absolutely love it. Curious, how did you manage to find a good insert and hood for $500 for 60 inches of range? I’m trying to do a similar hood for a 48 inch range and being quoted $1300 for the insert alone! Any tips/thoughts? Thanks in advance! Check eBay for inserts! We got a 48″ Electrolux insert with a remote blower (the bulk of the cost) and then built the hood ourselves–that part only cost us maybe $45 in materials. Hi guys, I didn’t see a post on how you built your hood. Are you considering writing one? I am also curious to know how you built your hood.. It looks great! Did you find plans online or just make something up? We just made it up. It’s built from 1/4″ plywood and we added trim. It’s the inside supports that are tricky and unique to each hood. And just FYI, hoods are generally recommended to be 1 size larger than your cooktop size (overlapping the cooktop by 3 to 6 inches on each side). For example, if your cooktop size is 30”, the ideal size would be a 36” or 42” hood. Thanks for breaking this down, guys! My husband and I move into our first home in less than two weeks and are going to be complete newbs at renovating. It’s nice to have a ballpark idea of which way things can go cost wise. Your kitchen turned out absolutely beautiful. Especially love that island! Super random question… what’s the paint colour on the walls in the kitchen? I’ve scoured through various post of the kitchen reno stage and I can’t find it noted anywhere. Haha, no worries at all. I don’t mind one bit. Thank you!!! I know money can be a tricky thing to write about because there will always be people that spent more or less than you and will have opinions. But this is so helpful! My husband and I are slowly renovating our whole house and saving penny by penny and posts like this are helpful to see. And your kitchen is beautiful! I love the mix of splurge and save. The overall feeling is gorgeous, approachable, unique and totally you! You guys knocked this kitchen reno out of the park. The double ranges still blow my mind. Genius move. Thanks for this, it is always helpful to get a general idea of the actual cost of things. Our last kitchen reno was a complete gut but we were able to do the entire thing for just over $9k. We’re trying to figure out how far to take our current kitchen with a renovation, this kitchen is a little more high end, and would require some additional work… so nice to have something to base it on! Your kitchen looks great! Side note, I’m trying to find a 36″ “professional” style range that isn’t Wolf, Viking, etc – did you come across a 36″ option in any of your research? It seems most stop at 30″. We have a 36″ gas cooktop and double wall ovens, but I’d like to replace with a 36″ range, and gain more storage and counter space back from the double wall ovens. Wow! $9K! Way to go. I did find some off-brand ones but with little to no reviews, I had trouble trusting them. The other thing about a 36″ range is you either get one really large oven or 1 slightly smaller than normal oven with another very small oven next to it. Neither of those options resonated with us which is why we landed where we did. But just google “36” range” and you’ll see a ton of options come up. We used Thermador in our kitchen remodel, they have a 36″ range. We were very happy with all of the appliances we bought, and they often have a “deal” where if you buy a whole appliance package, they include a dishwasher & hood for free. Let me know if you have any other questions about them & I will try to answer. I have a 30″ Bertazzoni I love (though it does have its quirks, definitely runs hot) which came with a matching hood, I believe it comes in 36″ as well. Check out ajmadison.com- when appliance shopping they really seemed to list everything, and a local appliance store was willing to price match. We ordered our fridge from them though without any problems! 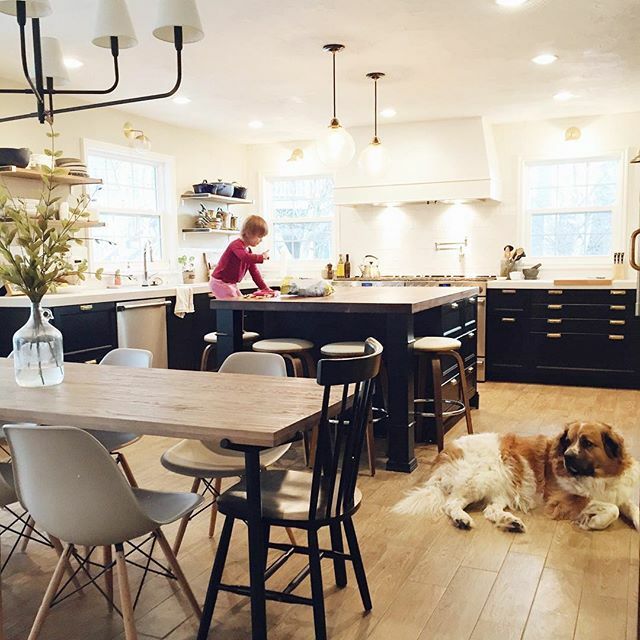 I love everything about this kitchen (and basically everything else you do)! We’re in the in-between-houses phase while we save up for a down payment and I am living vicariously through all my favorite home bloggers and everyone who has a house. So thanks for sharing!! It looks amazing though and it is the best bang for your buck when it comes to reselling your home in the future (hopefully at a time of high market). I love everything about your kitchen and that splurge on the island top was worth it. Are you still in Idaho? That’s where I’m from. 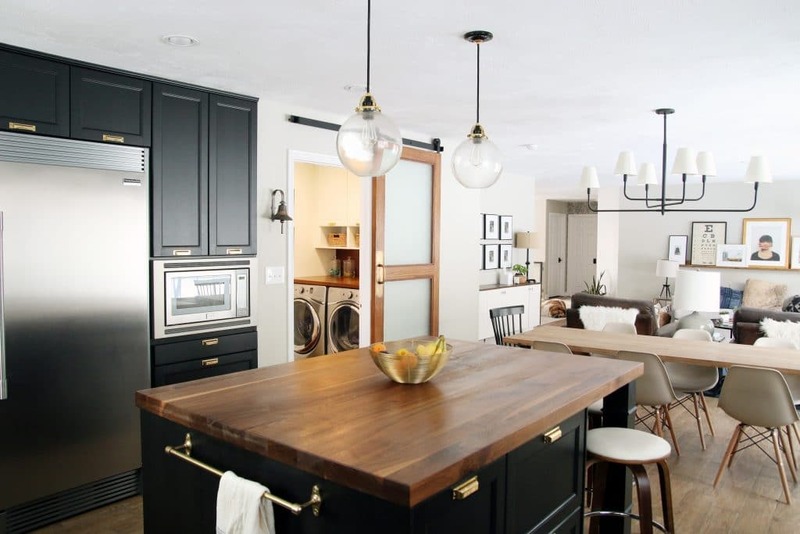 Your kitchen is quite possibly one of my favorite kitchen renovations I’ve ever seen. It’s absolutely perfect and I find myself swooning a little every time I see it! We are finishing up a little kitchen refresh that will hopefully tide us over until we can do something amazing like this – it always shocks me how far a little paint and creativity will go!